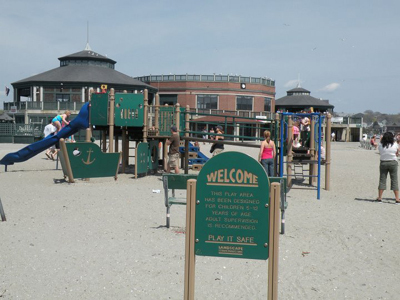 Newport RI Beaches - Sun, sand, live music and lobster rolls! Sun, sand, live music and lobster rolls! There are so many Newport RI beaches! Which one to choose? 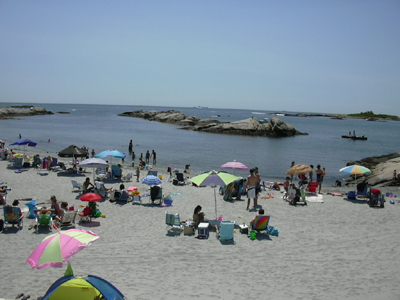 One of the best Rhode Island beaches, Easton's Beach (called 1st Beach by the locals) is located on Memorial Boulevard, right at the beginning of the world famous Newport Cliff Walk. 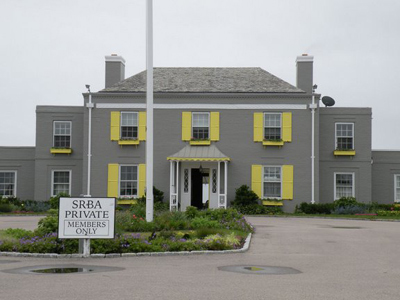 It is situated right on the border with neighboring Middletown, Rhode Island. 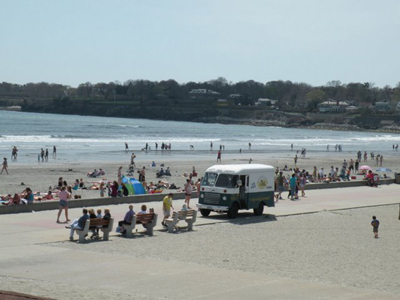 1st Beach is Newport's most popular beach. There is always much more going on here than at any of the other Newport RI beaches. 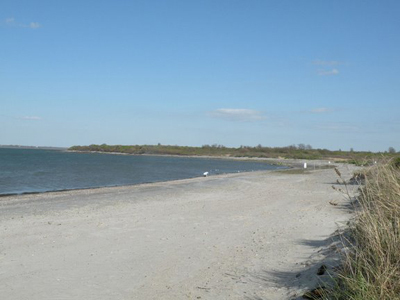 During the fall and winter, this beach is a nice quiet place to go for a run or walk your dog. But once the warm weather arrives, it's non-stop action. 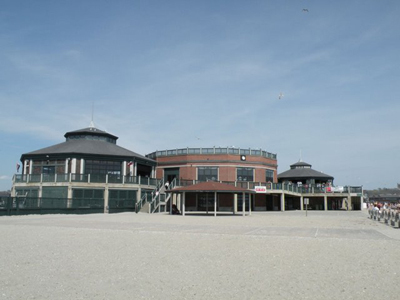 The Easton's Beach Rotunda is also a great location to hold your wedding reception or special event. You can get married right on the beach, and then walk just a few steps to the reception hall upstairs. 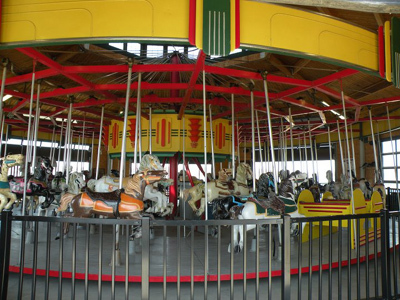 In addition to swimming and building sand castles, there are many activities for children here as well. I always loved coming to this beach as a kid because there was so much to do. For more information, call the office at 401-845-5810. 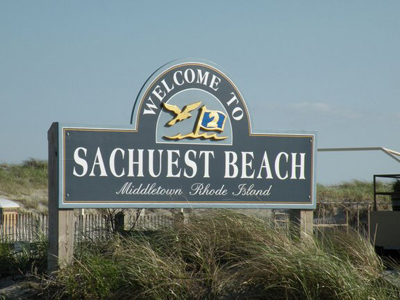 Sachuest Beach (2nd Beach to the locals) is actually in Middletown, but is still considered one of the Newport RI beaches. It is only a few miles from 1st Beach, and is next to the 300 acre Norman Bird Sanctuary. 2nd Beach doesn't have as much going on as 1st Beach, but it can still get pretty crowded during the height of the summer season. 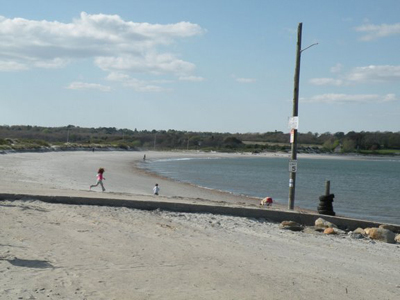 This beach is preferred by many over the other Newport RI beaches because it is a little more peaceful, the water is cleaner (less seaweed), and the waves are better (surfers prefer this beach). 2nd Beach has a concession stand with a good sized menu, and there's usually a Del's Lemonade truck at the western (surfer's) end of the beach. 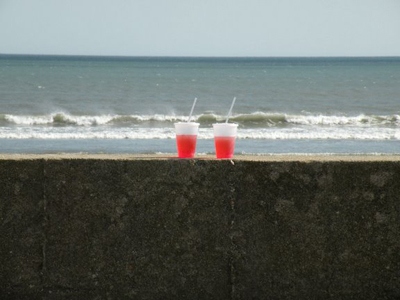 Whether you like going to the beach alone, or you'd like a quieter trip to the beach with your family, this is the spot. 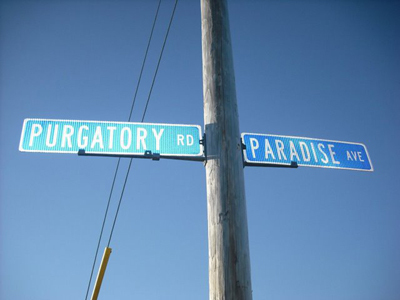 Check out Purgatory Chasm, which is at the top of the hill at the western end of the beach (at the intersection of Purgatory Road and Paradise Avenue). This is a really cool chasm cut into the rocks by millions of years of erosion. There is a small lot where about 10 cars can park, with a 30 minute limit. Or just walk up there from the beach. It's definitely worth checking out. Daily parking: $10 weekdays; $20 weekends and holidays. 3rd Beach is a little further down the road past 2nd Beach in Middletown. This beach is pretty small, but it is extremely peaceful. This is a great spot to come for some quiet relaxation, or if you have little kids who just want to splash in some calm water. 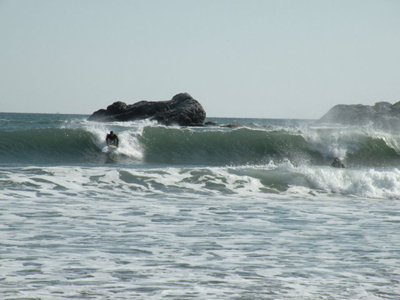 Because this beach is actually set back in a cove, there aren't many waves here. You do get some nice breezes though, which makes this a good spot for wind-surfing. There is also a public boat ramp here. Unless you've got some connections, this picture below is about all you're going to see of Hazard's Beach, which is also private. Don't feel bad though. 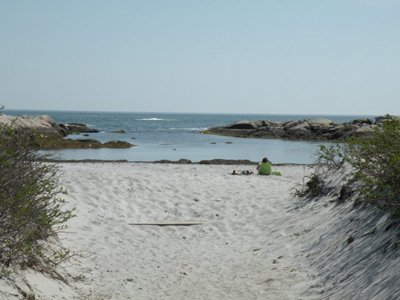 Nearby Gooseberry Beach is just as nice. 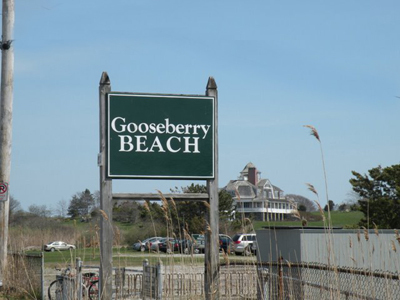 Gooseberry Beach is located along the famous Ocean Drive, only about a mile from historic Bellevue Avenue and the Newport mansions. This is another beach that is set back in a cove, so you won't get big waves here. You'll find many families and school age kids at this beach. Gooseberry is open to the public, but the beach club is private. If you get hungry during the day, you can grab something at the Gooseberry Cafe. This beach is open from 9-5 daily. Daily parking: $20. Seasonal pass: $250. 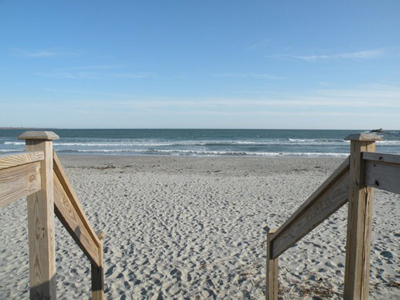 Bailey's Beach is private, and is known as one of the most exclusive beaches on the east coast. 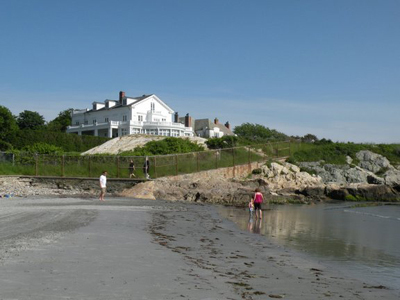 This is the beach where America's elite "bathed" during the Gilded Age. They moved from Easton's Beach to this location so they wouldn't have to mix with the lower classes. 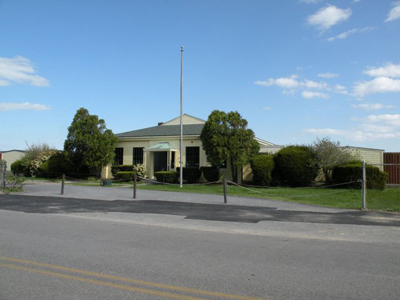 Unless you've got some good connections, you won't be "bathing" here during your stay in Newport. 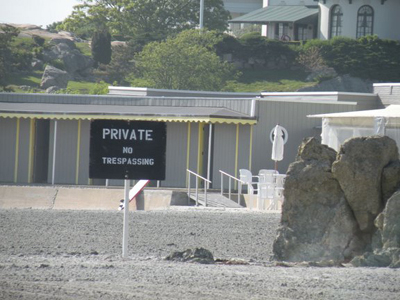 Reject's Beach, located at the end of the Newport Cliff Walk, isn't an official beach. It's actually at the unwanted portion of Bailey's Beach that Newport's Elite have left for us "common folk". Bailey's and Reject's beaches are separated by a fence and rope that goes out into the water. This is a small beach that not many people know about. There's also no parking, so you can only get here by bike or on foot. But these are good things, because if you come here, you may just be lucky enough to have your own private beach for awhile. Enjoy it! 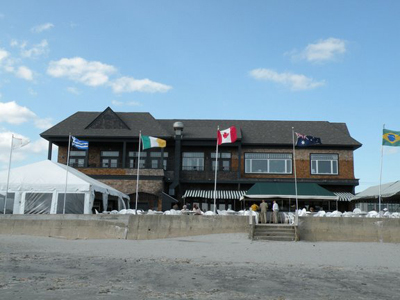 Of all the Newport RI beaches, the best spot for live music and a wild time is the Atlantic Beach Club. This is where the college-age crowd (and those who wish they were still in college) hangs out during the summer. 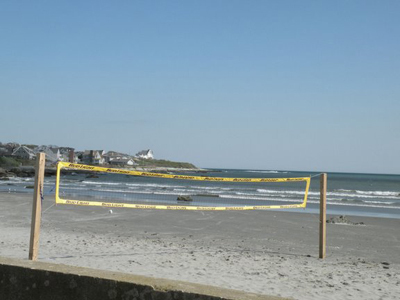 This is a great spot to play some beach volleyball, eat some clam cakes and enjoy a beverage (or three...or five-just don't drive!) while listening to the live bands that play here. Zoom in on any of the placemarks below to get a better idea of where each of the Newport RI beaches are. You can also switch to the satellite view to see more detail. For directions to each beach from your location, just click on the placemark, click on "To here" and then enter your starting point. 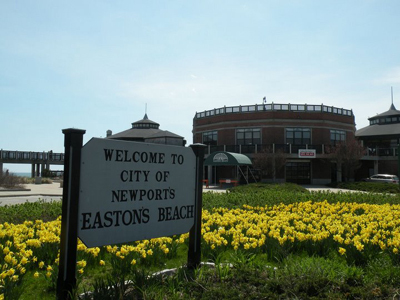 Of all the things to do in Newport, the beaches are always a popular choice. I'm sure you'll enjoy them as much as everything else the "City by the Sea" has to offer!